Superga® was born in 1913 in Torino, Italy when Walter Martiny started production of rubber-soled footwear marked with the Superga logo. In 1925 Superga's designs expanded to include shoes with vulcanized rubber soles and the 2750 Heritage style was unleashed! After World War I, Superga restarted production specializing solely in the production of high quality footwear. In the 1970s, Superga diversified to add sport shoes with technical attributes. 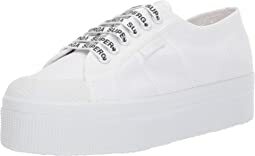 Now the collections include Superga City leather and Superga Country rubber rain and outwear boots in addition to the original Superga Vulcanized and Sport lines. Superga celebrates the fun lifestyle of the 2750 by offering a wide range of colors, fabrics, and prints each season for women, men, and kids. And for the fashionistas, Superga Limited Edition shoes feature the 2750 design in collectible, limited production designs. This was my second try with these shoes. First, I ordered my normal size. They slipped and I nearly walked out of them. so I returned them and ordered a half size smaller. They still slip on my heels. I have narrow heels and I think this style will not work on my feet. I was really excited to try these shoes. Unfortunately, they felt a little too big. I wasn't very fond of them on my feet either. Really wished they had worked out. Look great but are not at all comfortable. Very stiff and uncomfortable. This is a well made, comfortable shoe, especially if you have relatively wide feet. I did not need to order down, as some suggested, but a relatively narrow foot might. I liked these shoes and they fit and looked good, but they were VERY HEAVY. I needed the height to help me walk with a walking boot since I broke a bone in my foot, and they were perfect height for that purpose. I was surprised by the arch support, which I need and didn't expect to have in these. I really wanted to love these?. I first ordered Zappos recommended size and it was too big. So went to my usual euro size and the length was right but they were too wide (especially in the heel). I also thought they were super heavy. Style is awesome! I would certainly try them. I tried the Superga Women's 2750 Cotu Classic 1 Sneaker and it felt too tight in the toe box. I'm not totally sure how this Superga 2750 is different, I think unisex? ?, but the toe box is much roomier. I want to like them more than I do. Kind of form over function which goes against my grain, but these are the perfect look in a sneaker. I am going to keep them. I do wish the laces were a tad longer. Can barely tie them into a bow. I love the way these shoes look! I am normally a size 8 but got a 7.5 and they fit perfectly. I love how these make my legs look longer and I feel taller. The shoe is narrow on the toes and wider at the heel although you can balance that out with a sock! I find that not wearing sock is the way to go with these sneakers - because my no show socks always crunch up. Great shoes that go with anything- no break in time. First wear I was on my feet the entire day, no blisters or discomfort! These are a really great shoe! This one fits true to size and is actually on the wider width which makes it so comfortable. However I don't find this to have much cushioning and that's why I add my Dr Scholl's insoles and to do that I did have to size up. I wish the insoles were removable, but overall love the classic look. Looks great with jeans, dresses, shorts, anything. I am so sad I have to return these light grey cute sneakers. They are well made and felt good instantly but their sizing chart is off. I followed the size recommendation for U.S. women's 9.5 and it was at least a half size too big, maybe even a full size for some -- I'm in between 9 and 9.5. By the time I returned them there were none left in the smaller size. Boo. Please bring them back! Great shoes for the summer. I love these shoes. light and comfy for every day strolling. they look super cute paired with a sundress. much better than leather sneakers. These are always in style. My favorite tennis shoes. Fits true to size and very cute. I thought these were cute for the price but they are very wide as others have commented. In fact, it even says "wide" on the manufacturing tag attached to the shoes. Zappos should have included this info...There is not a lot of padding either. Sadly, they are going back! I have had my pair for the past 2 months and love them. They were comfortable right out of the box, no socks, no blisters, true to size fit. They are comfortable, not really heavy and mine do feel flexible. I was concerned they would feel like stiff, heavy boards strapped to my feet like some espadrilles and they do not. Perhaps my great experience is influenced by my height- 5'11" and let's just say I don't weigh 120 lbs. My challenge is keeping them white and clean which will involve a soft bristle brush and bottle of dish soap! I like the construction and think they will last more than one summer season. I wear mine with pants to work in casual California. I think they were a great purchase. Hard to get used to at first - fell on my face multiple times until I got used to the thick sole. I then wore them on a trip to Italy and survived 20k steps a day with no blisters. Could use a little more arch support and sometimes feel too wide, but overall a great shoe. Length was right, but this is a very high-volume shoe. Terrible for skinny or narrow feet. 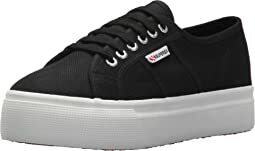 This is a cute shoe, super comfy with good squish, like all other Superga shoes. HOWEVER, i ended up returning because the style seems suited for somebody over 40, if you know what I mean. It's the way the bugs are distributed on the shoe plus the overall shape. Nice shoe but HUGE! As per other reviews I ordered a half size lower than normal, but even that was too big! By a lot. And it was really wide on my foot. I would recommend ordering a full size down.